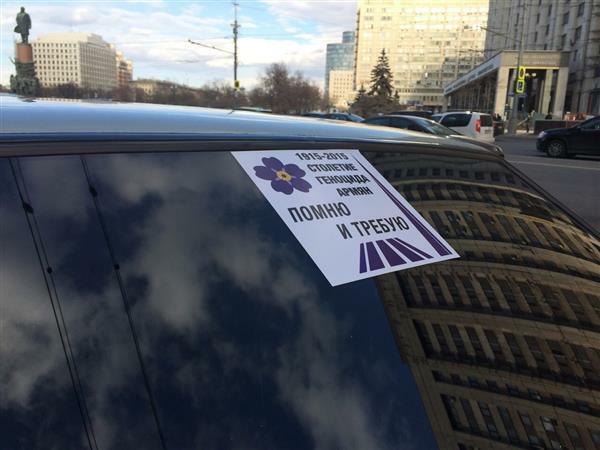 Всего месяц назад сотрудники редакции 100 LIVES из Еревана, Парижа, Берлина, Буэнос-Айреса и Москвы освещали посвященные 100-летию Геноцида армян мероприятия прямо с места событий. 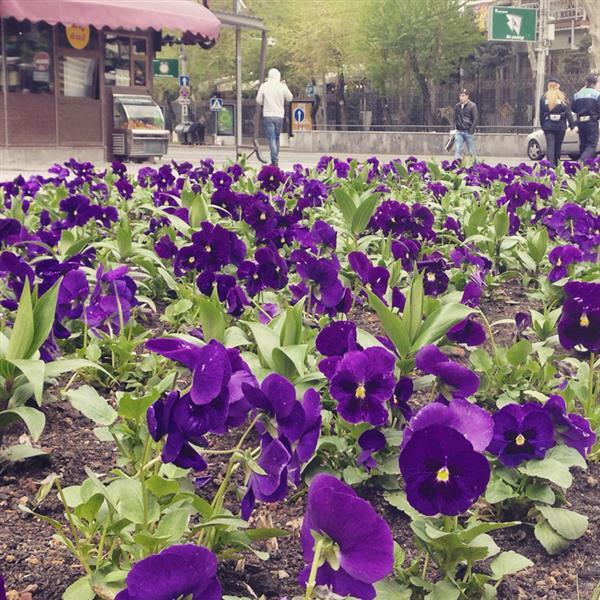 Теперь мы отобрали для вас все лучшее из их репортажей: видео, фотографии, интервью и цитаты – как официальных лиц, так и обычных людей. Такого вы не найдете больше нигде, но если повезет, можете отыскать себя на фото! 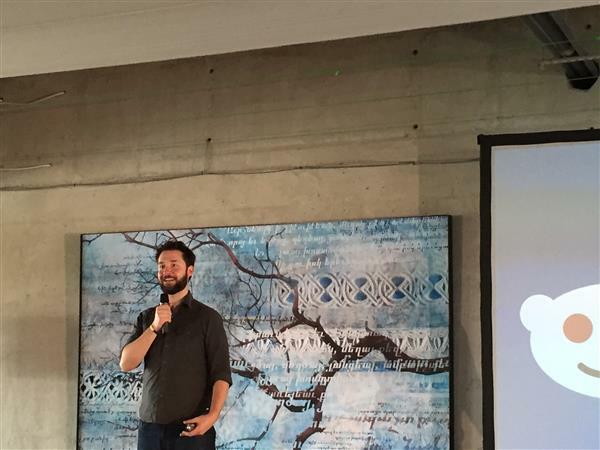 Alexis Ohanian, founder of Reddit, in an exclusive interview to 100 LIVES: "Everything that's been happening in the last week has been adding to the momentum and amplification of history, of the Genocide. I've had people reaching out to me today to say that just because of the posts I made on social media, they went and learned a little more about the Genocide. They would say, 'I've never heard of this before, why wasn't it in my classroom?' So every bit of this helps – every tweet, Reddit post, or a film. All of these things help tell the narrative of the story. 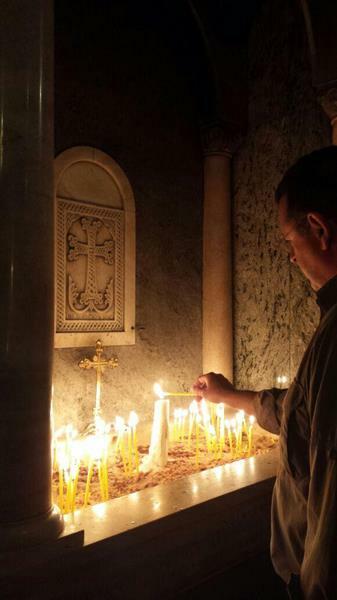 This is only my third trip to Yerevan. But it's been a really special one. 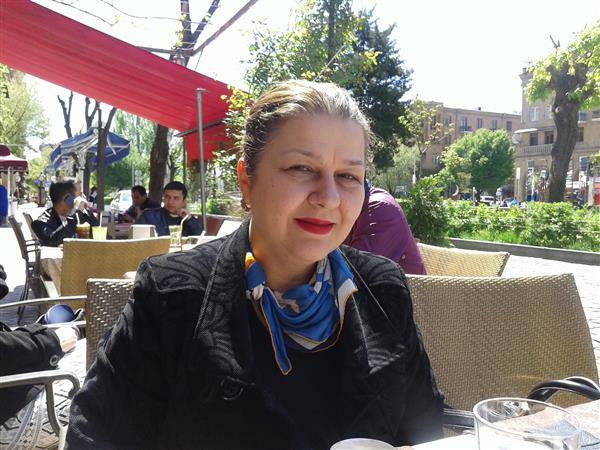 My birthday is on April 24, and I celebrated it in Yerevan before. 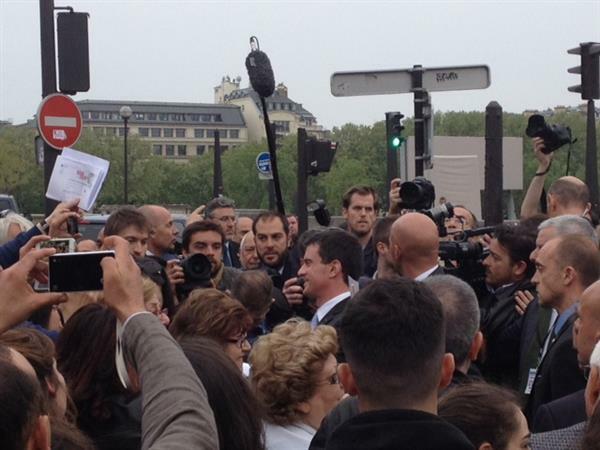 But to be here on the Centennial with my father and my family was really special, a lot of emotions. What I was so excited about today is that I remember what the 25th was like the last time I was here a few years ago. But it feels like today is a little bit more electric, a little bit more energetic, maybe because I spent the morning at the Tumo Center for Creative Technologies with a bunch of kids who were rocking out and telling me about all the cool stuff they were building, or because I've been meeting Armenian entrepreneurs who are building amazing start-ups in Yerevan. 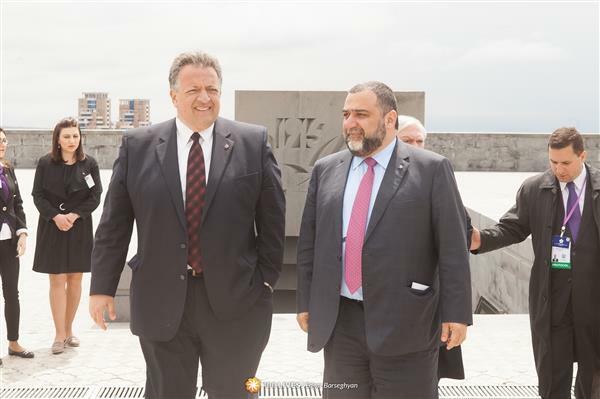 It felt special, and I really hope we're going to be talking about the next hundred years of Armenia and it's future, because that's what's so bright." 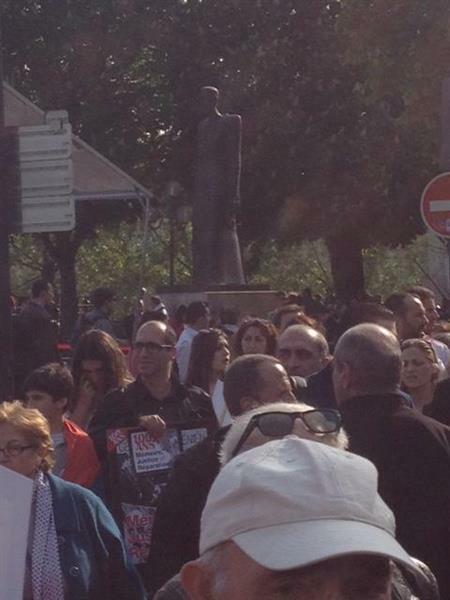 Young Frankfurter at the commemoration event in Germany. 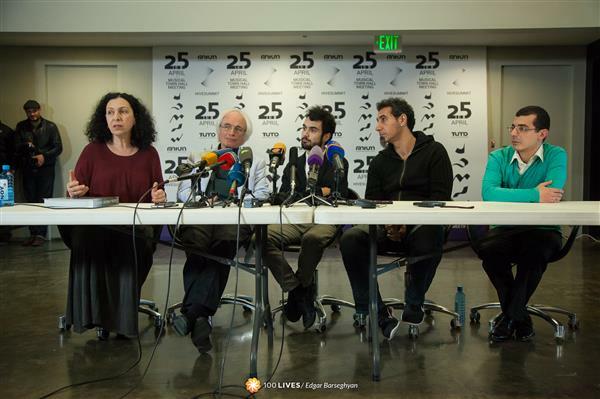 A press conference involving Serj Tankian of SOAD, Tigran Hamasyan, Tigran Mansuryan and Liit Pipoyan is underway at the HIVE tech summit in Yerevan. 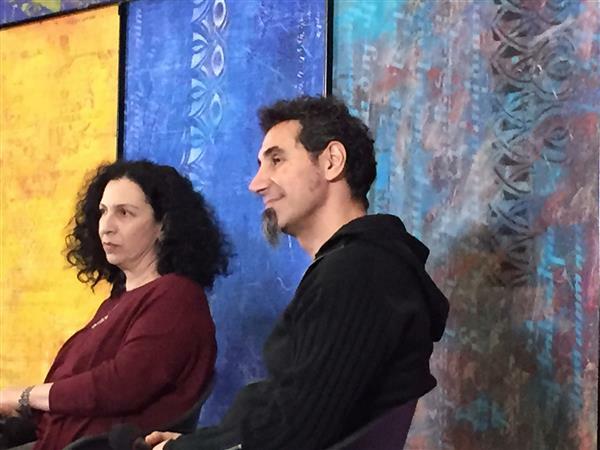 Serj Tankian on choosing a career in music: "When I started doing music, it wasn't a choice for me. By the time I was fifteen, by the time I was twenty, I already knew that it was my vision and my path. If you don't feel the same way, don't take that path, don't go down that road." 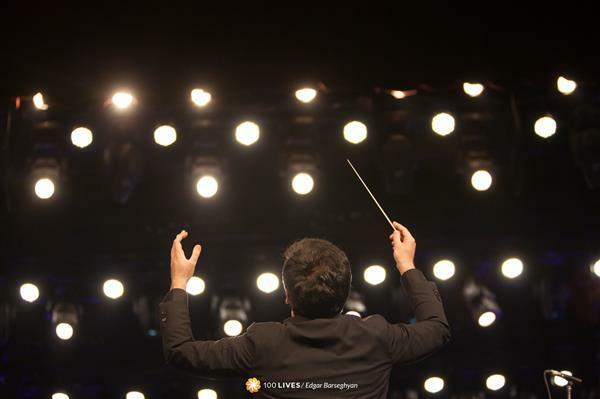 The World Symphony 24/04 Orchestra concert in the Republic Square on April 24. Serj Tankian on the SOAD concert: "This concert was a very unique experience for me. Very electric, that's the word that comes to my mind. We didn't expect people to know the words and sing along in English! I have performed in Armenia before, but never with System of a Down. So it was a completely new experience for me and the members of the band, and we were very happy with it." 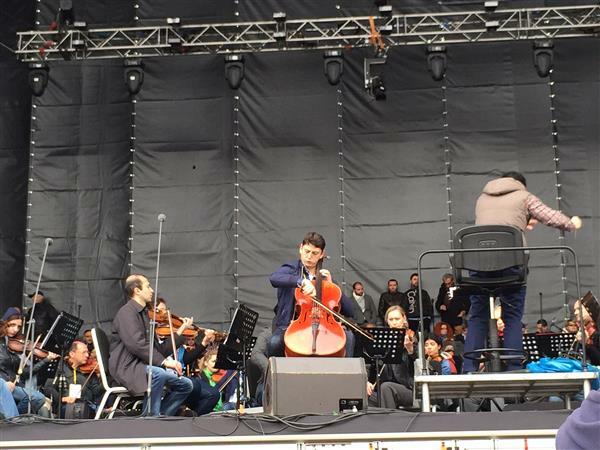 Jivan Gasparyan at the World Symphony 24/04 Orchestra concert in the Republic Square on April 24. 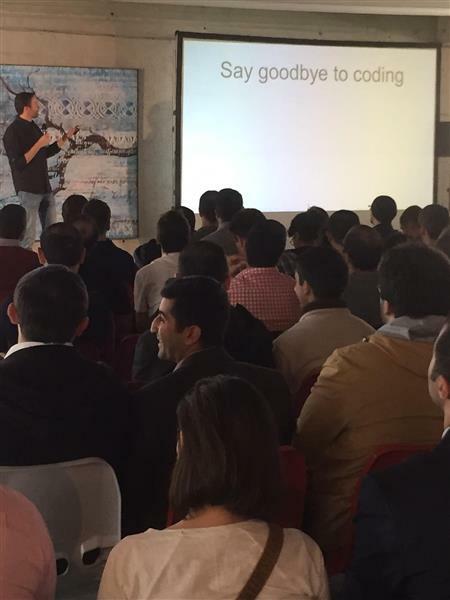 Raffi Krikorian of Uber: "Stop thinking and talking about Armenia as landlocked, it doesn't matter. Intelligence is equally distributed no matter where you are." 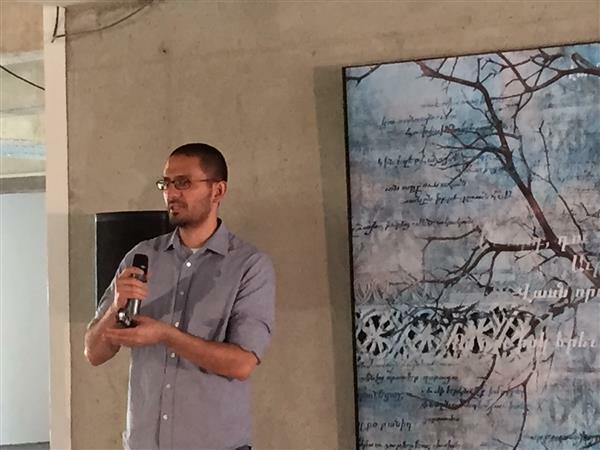 At the HIVE leadership summit in Yerevan. 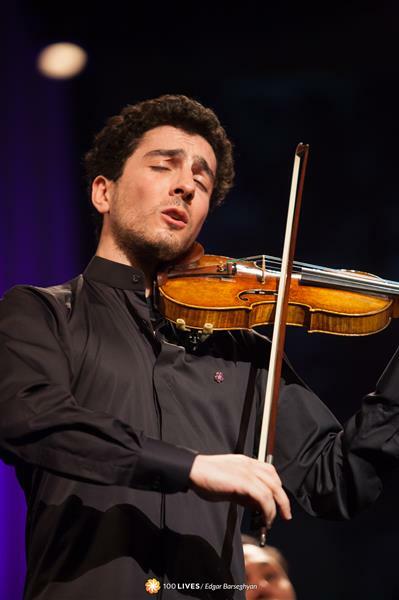 When answering a question from the audience, here's the piece of advice Tigran Mansourian gave to all young Armenian musicians today: "Stay true to the family tradition. Our songs, our love, our language are important, because our family is our fortress". 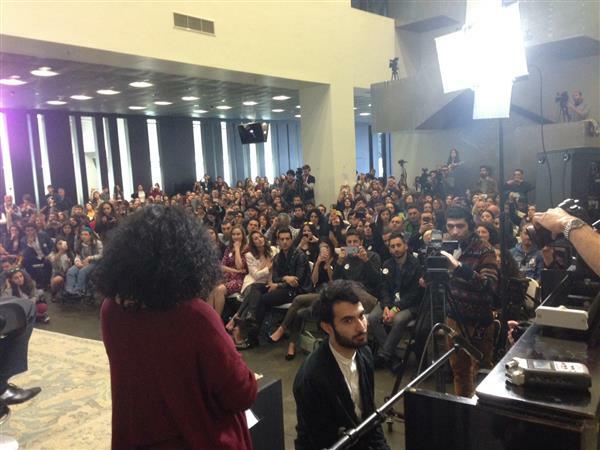 Lilit Pipoyan and Tigran Hamasyan improvising at the Music Town Hall Meeting a the Tumo Center in Yerevan. 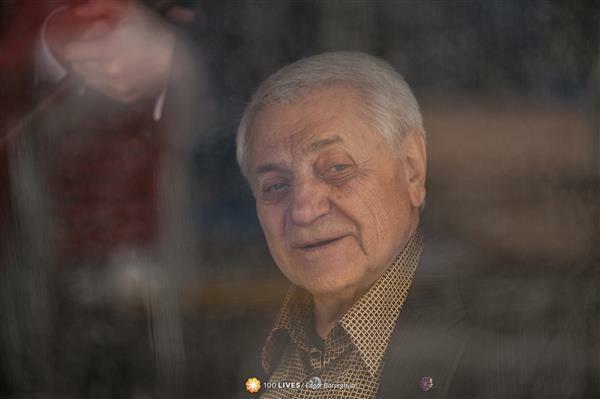 Armenian composer Tigran Mansourian: "After a hundred years, we are finally embarking on a new journey. One hundred years and one day later, today is the first day of the future." Serj Tankian, lead singer of System of a Down: "When it comes to creative process, the musicians, the composers are often lost in their pieces. It comes from the collective consciousness. I often don't even know what I'm doing". 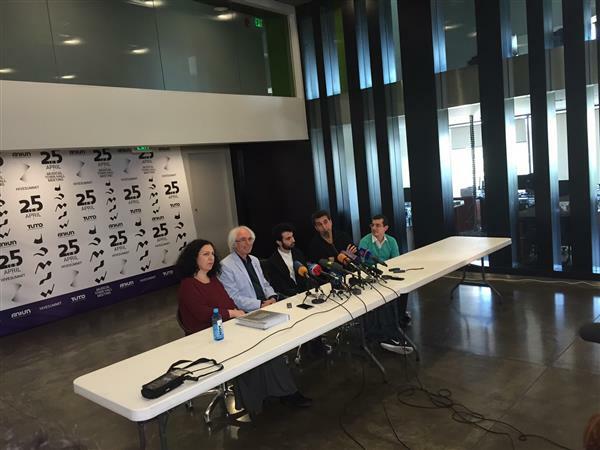 Composer Tigran Mansourian: "Our heritage is our wealth". 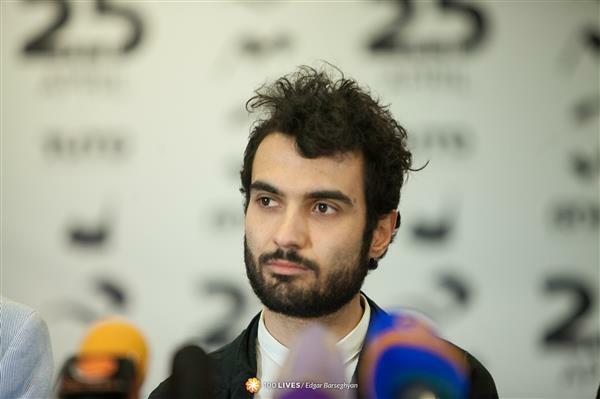 Leading artists and composers have gathered today at the Musical Town hall meeting in the Tumo Center in Yerevan to discuss new approaches to Armenian music following the Centennial. Serj Tankian on how the international audience reacts to Armenian elements in his music: "Seeing art or listening to music is often compared it eating. Specifically, to eating pizza. Some like the crust, some prefer cheese, many appreciate the meat - but it's still the same pizza. 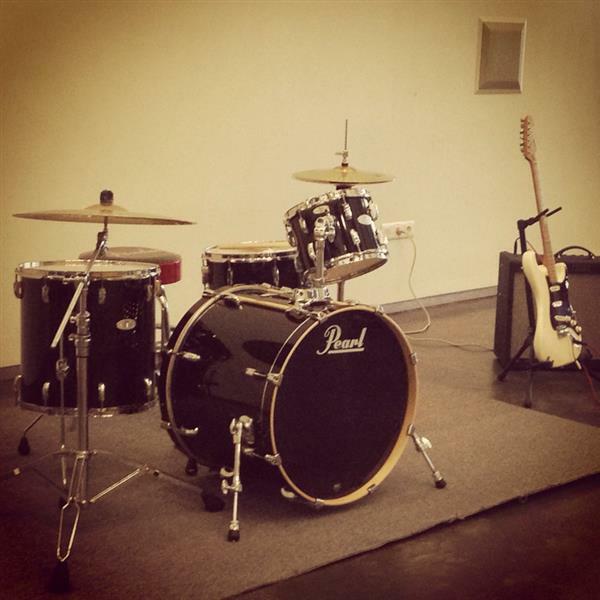 The way we perceive art or music is defined by our own experience." 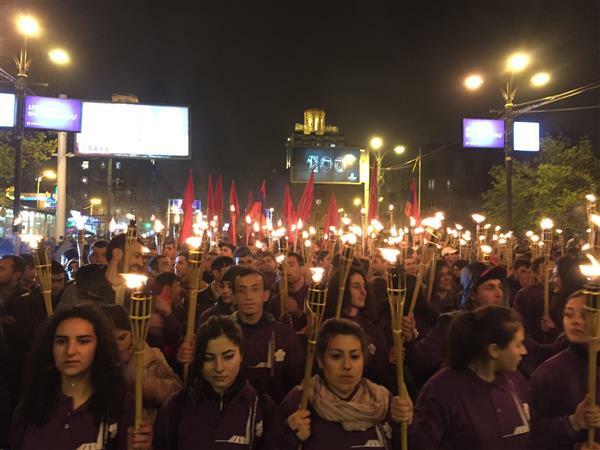 Torch bearers at last night's procession to Tsitsernakaberd in Yerevan. Lilit Pipoyan, Armenian musician, performing at the Music Town hall meeting. Earlier she said that both joy and sadness have a place in life and in music. Serj Tankian about a piece he wrote to commemorate the Genocide: "I composed this tune together with a friend from New Zealand. He called me and asked what I was doing for the Centennial, so I told him about the SOAD tour. And he said: 'Yes, but do you want to do a piece together?.' So I composed the first five minutes, and then he did the next five. The idea was that in the beginning the music is very sad, it makes you think about the Genocide, and then it becomes more triumphant." 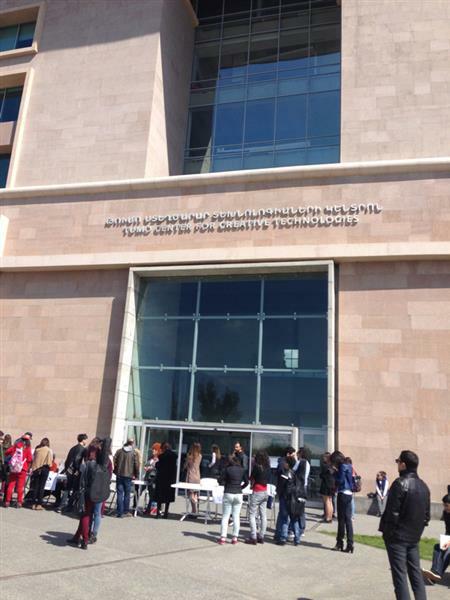 Serj Tankian spotted at the Music Summit in Tumo in Yerevan. At the torch-light procession to Tsitsernakaberd in Yerevan. 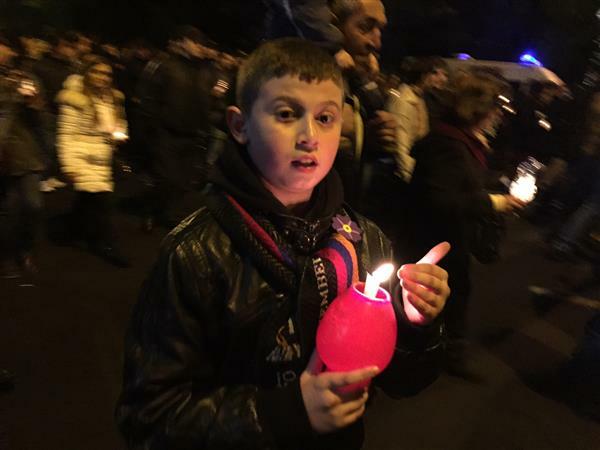 People of all ages came together during last night's traditional torch-light procession to Tsitsernakaberd in Yerevan. 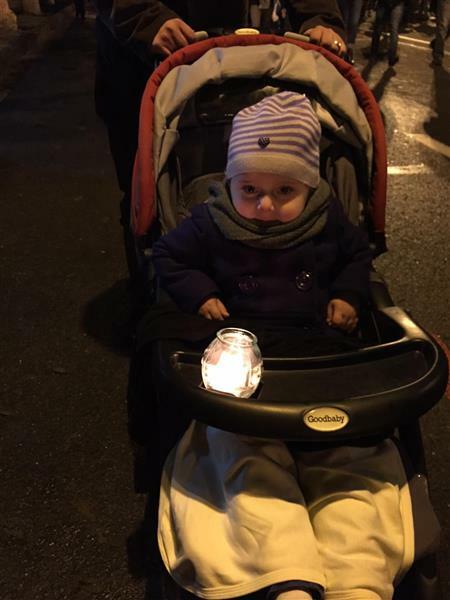 The cutest participant of last night's traditional torch-light procession to Tsitsernakaberd in Yerevan. 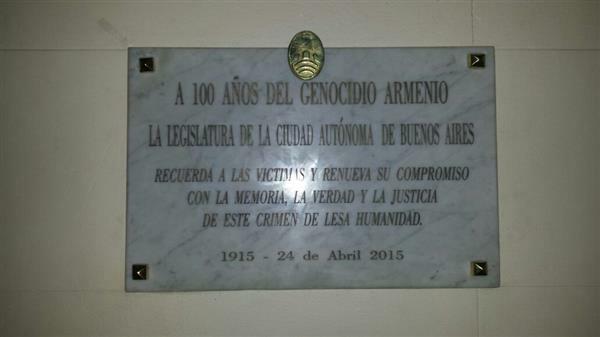 A commemorative plaque was installed by city legislators at St. Gregory church in Buenos Aires. 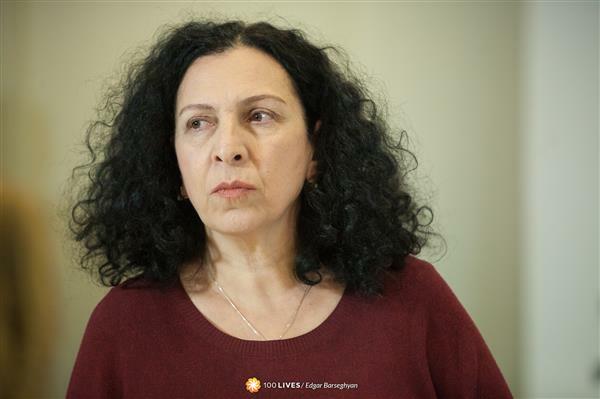 Leading artists and composers will gather for the Musical Town hall meeting in the Tumo Center in Yerevan, where they will discuss new approaches to Armenian music following the Centennial. 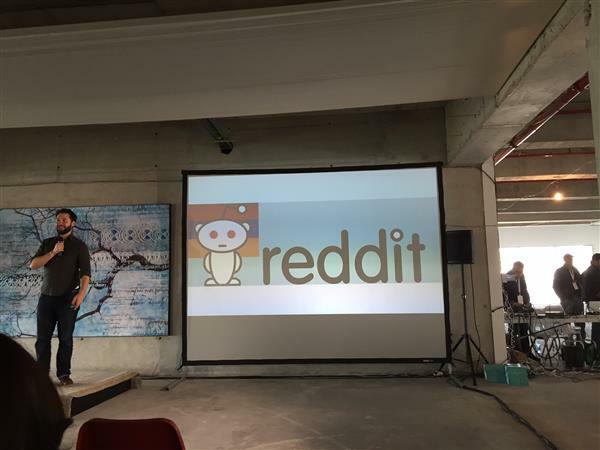 The Tumo Center for Creative Technologies in Yerevan, Armenia, is hosting not one but two major events today: the HIVE summit and the Musical Town hall meeting. 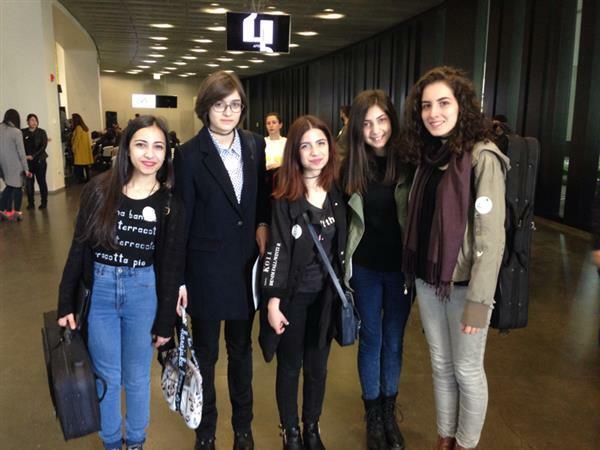 Young Armenian musicians Yana, Shushanik, Elizabeth, Eva and Ani are really excited to be at the Tumo Center today. 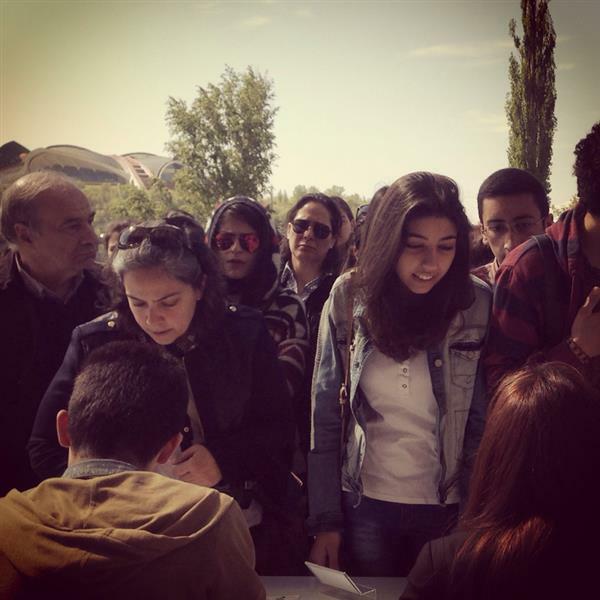 People registering for the Musical Town hall event at the Tumo Center, Yerevan, where Serj Tankian will lead the panel dedicated to new approaches to Armenian music following the Centennial. 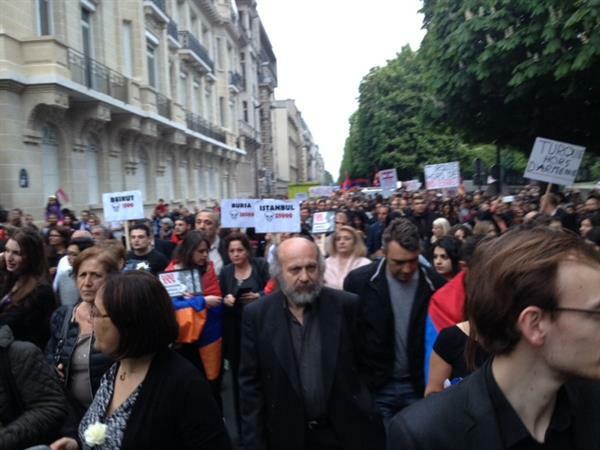 Commemoration of Armenian Genocide, near Komitas Statue, Canada Square, Paris. 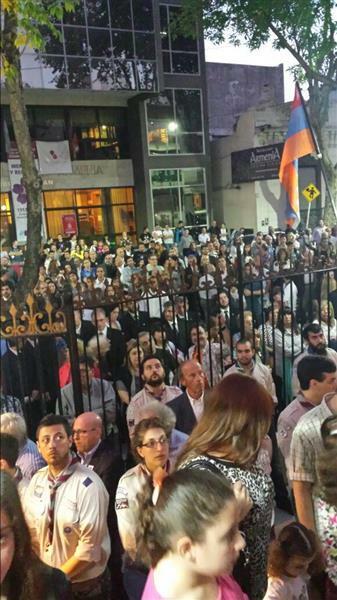 Mass to commemorate Armenian Genocide at the Cathedral of Córdoba, Buenos Aries, Argentina. 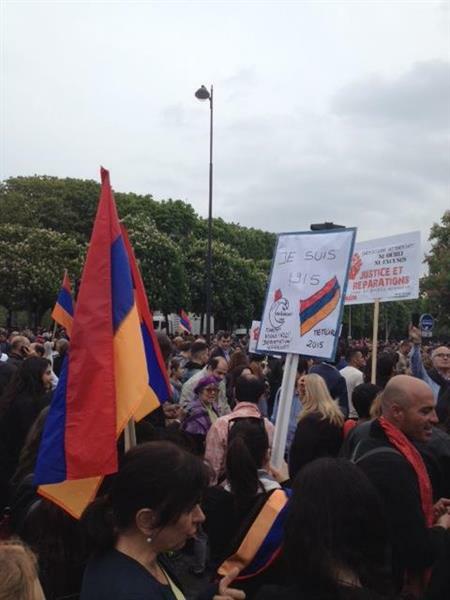 Armenians joining in in Moscow. The SOAD concert in Yerevan last night was all about life. 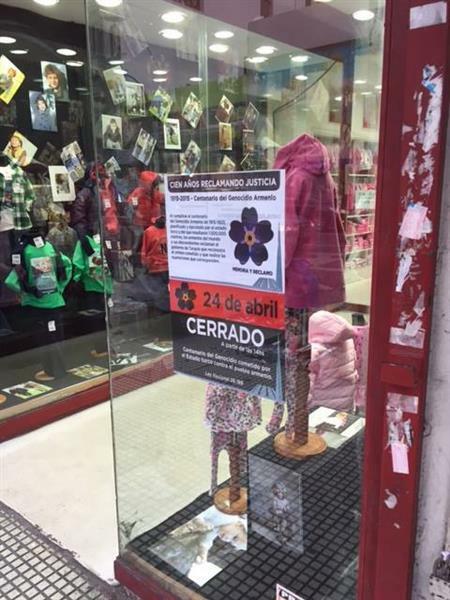 Many stores are closed in Buenos Aires for the Armenian Genocide Centennial. 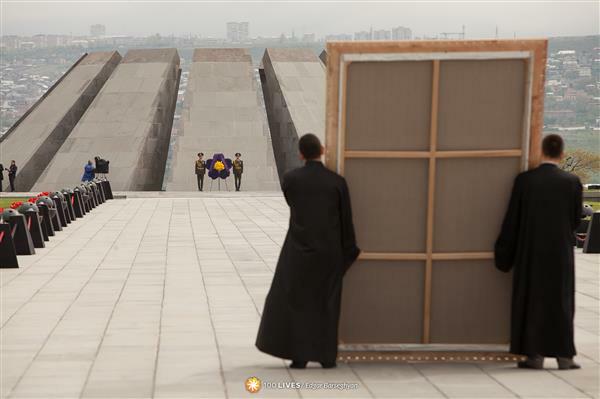 Commemoration of Armenian Genocide, Tsitsernakaberd, Yerevan. 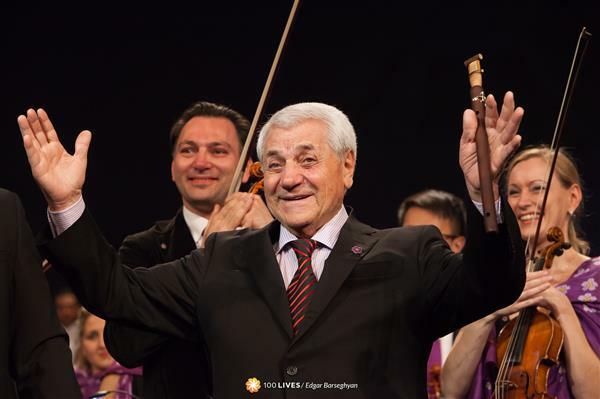 Jivan Gasparyan, one of Armenia's greatest musicians, is the master of the duduk. 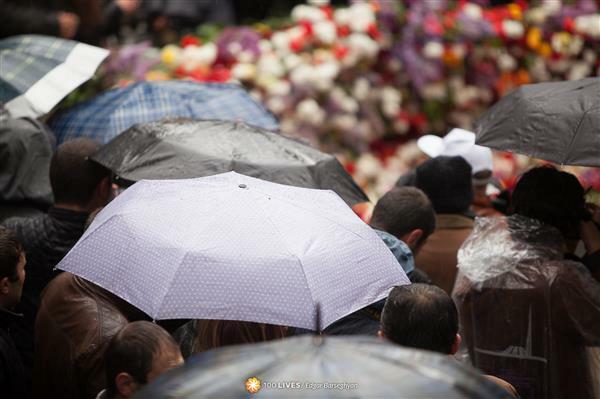 People line up in the rain to commemorate the victims of the Armenian Genocide at Tsitsernakaberd. 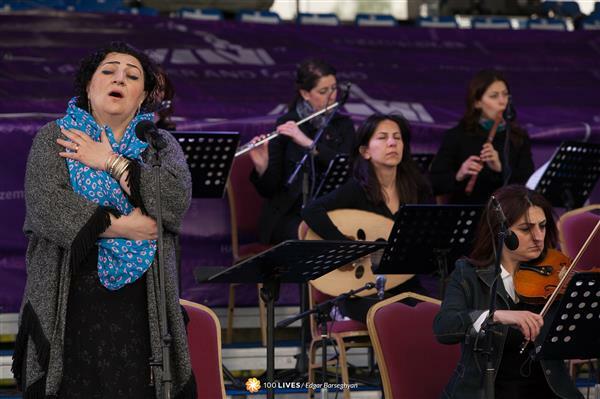 A soulful performance to mark the Armenian Genocide Centennial. 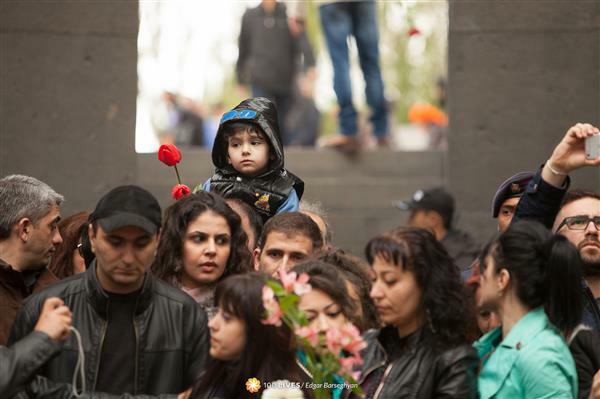 Many generations of Armenians are mourning victims of the Armenian Genocide at the Memorial Complex in Yerevan. 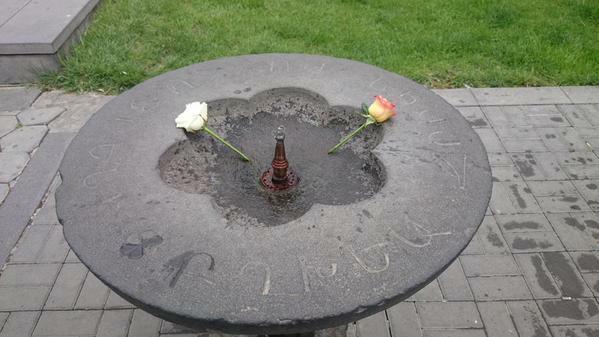 There is little room left for flowers at the Genocide Memorial Complex in Yerevan. 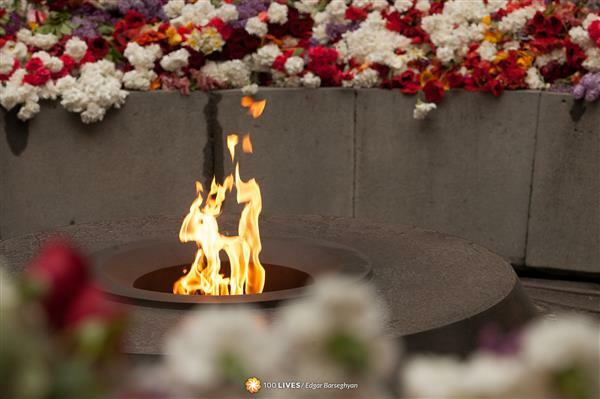 Eternal fire burns at the Genocide Memorial Complex in Yerevan. 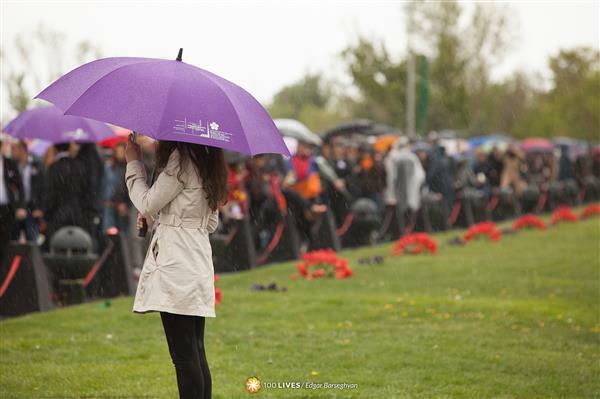 Heavy rain can't stop Armenians from paying respects to victims of the Genocide. 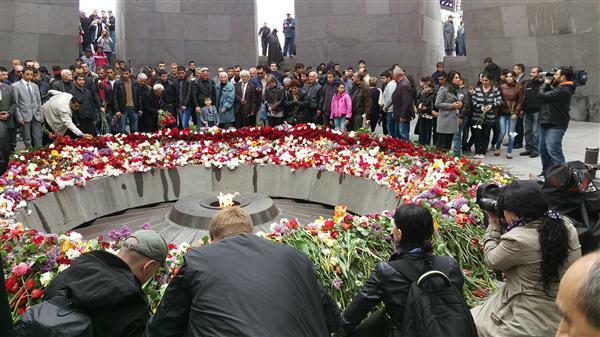 Flowers at the Tsitsernakaberd Memorial Complex. 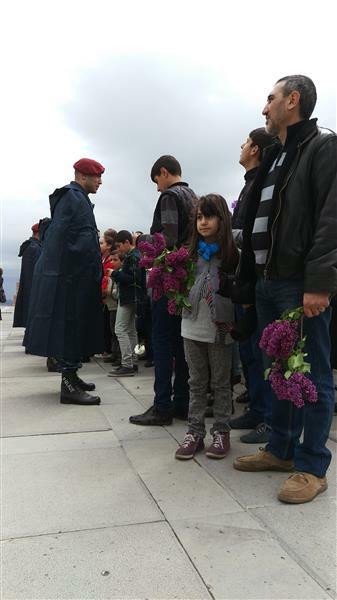 People lining up to lay flowers at the Tsitsernakaberd Memorial Complex. 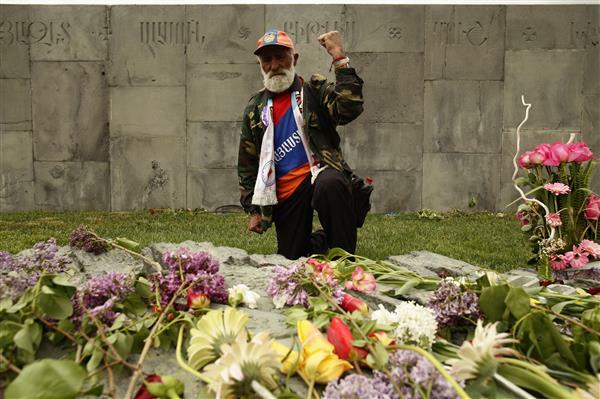 A proud Armenian at the Tsitsernakaberd Memorial Complex. 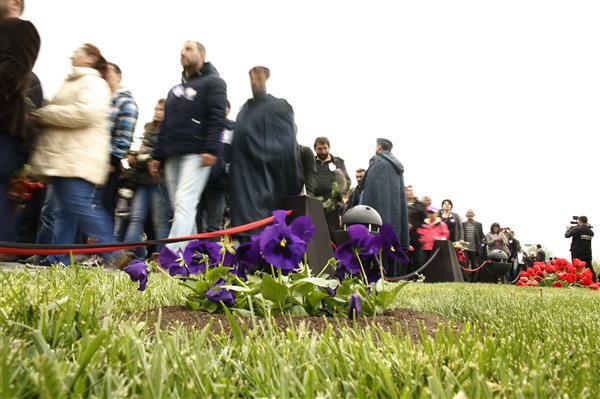 Armenian Genocide Commemoration Ceremony at the Tsitsernakaberd Memorial Complex. 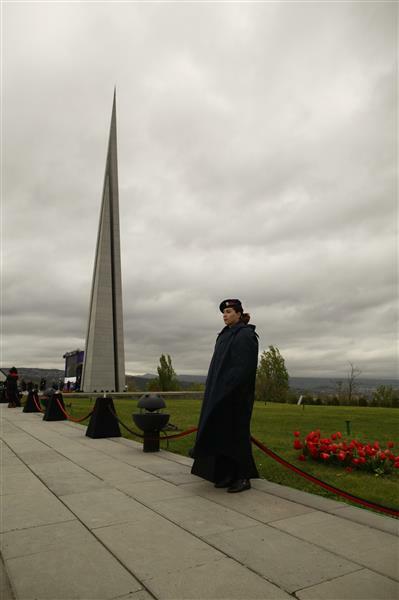 Policewoman at the Tsitsernakaberd Memorial Complex. 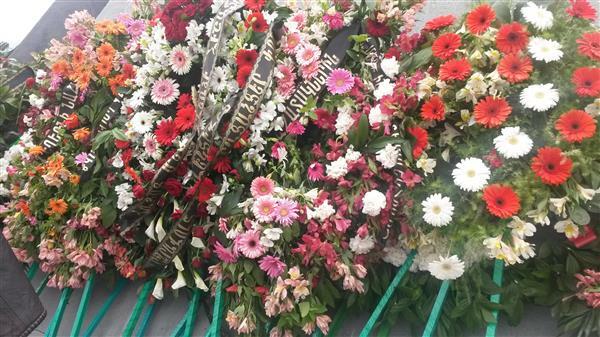 Flowers laid this morning at the Genocide Memorial Complex in Yerevan. 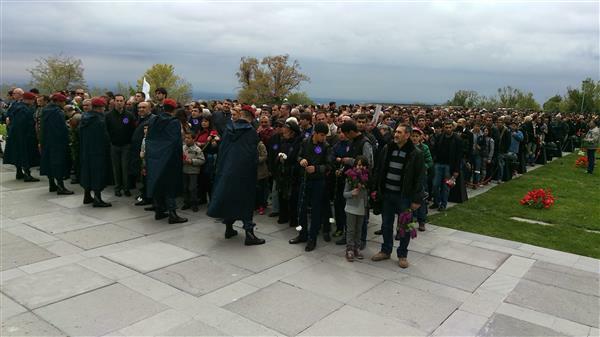 Media photographing mourners at the eternal flame in Tsitsernakaberd. Police holding back the line of people at the Genocide Memorial Complex. 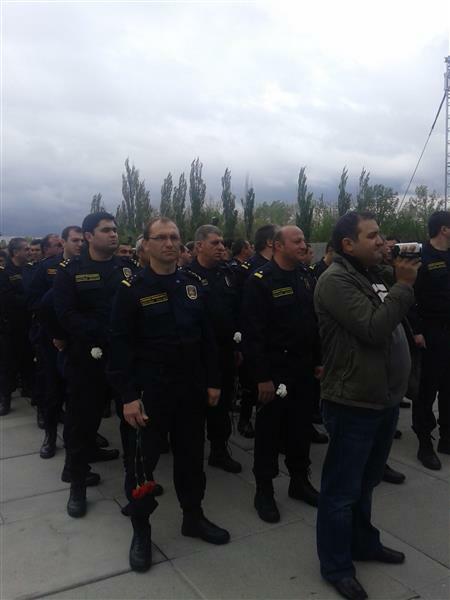 After an official ceremony where four heads of state and internationaldelegations lay flowers at Tsitsernakaberd, Armenians and guests fromaround the world came in the thousands to pay their respects.Pictured here is a unit of the Armenian Customs Service. People waiting in line to lay flowers at the Memorial Complex. Tom and his friends are from Poland. 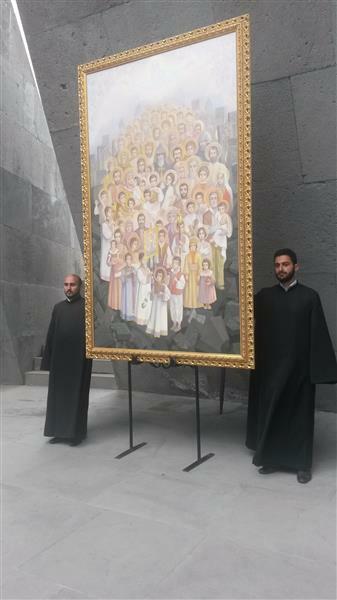 They came to Yerevan for the SOAD concert and other commemoration events. 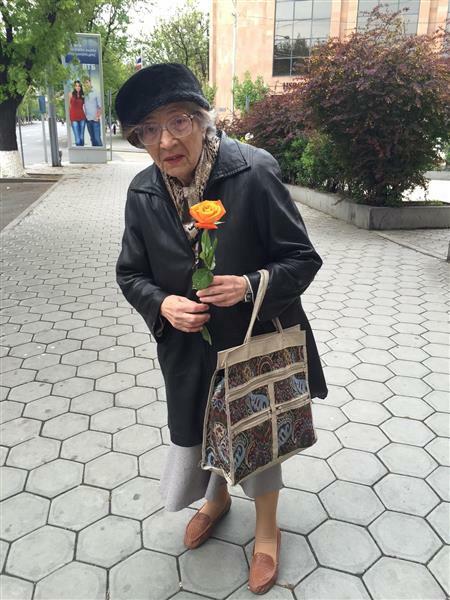 Galya Hovsepyan, 75, on her way to Tsitsernakaberd. Girl and father waiting to lay flowers at the Genocide Memorial Complex. Simon Sarkisian from Glendale, California, came to Yerevan for the Centennial. 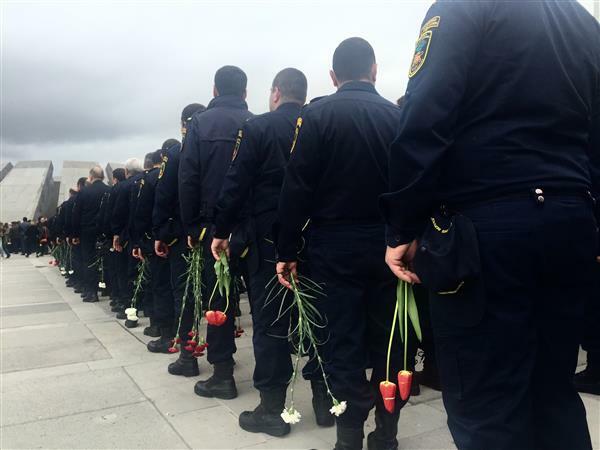 Police officers wait to lay their flowers at the Genocide Memorial Complex in Yerevan. 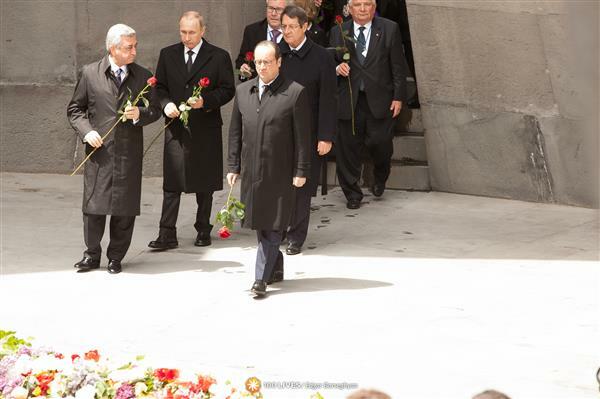 World leaders at the at the Armenian Genocide Commemoration Ceremony. 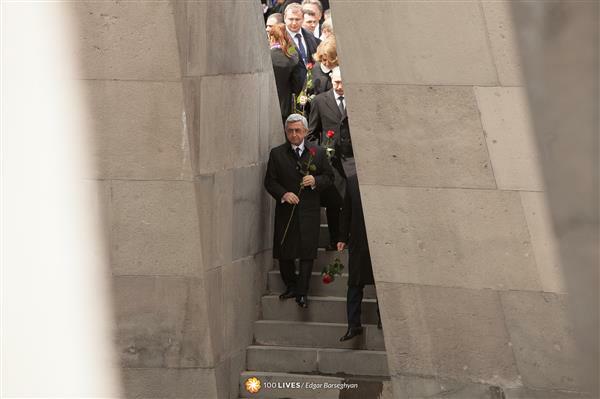 The President of Armenia Serzh Sargsyan at the Armenian Genocide Commemoration Ceremony. 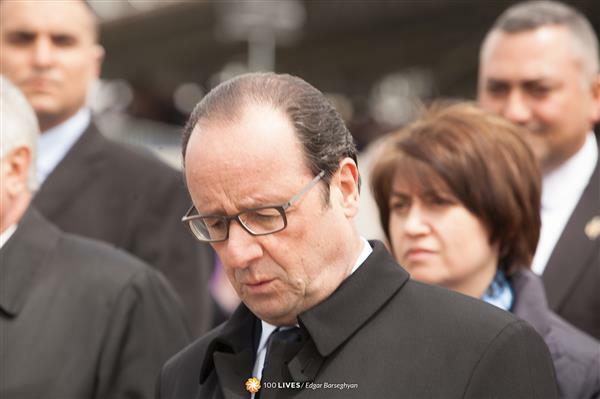 French President Francois Hollande at the Genocide Commemoration ceremony in Tsitsernakaberd. 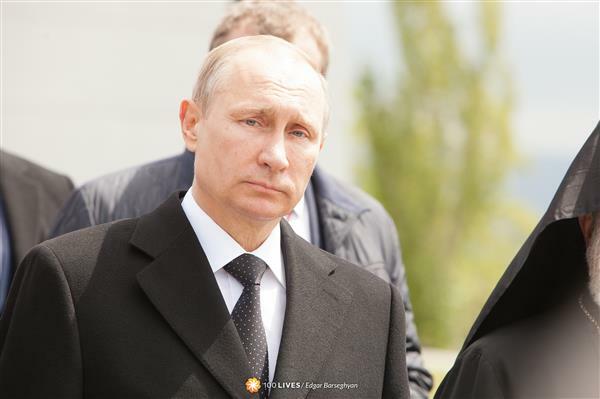 The President of Russia Vladimir Putin attending the Armenian Genocide Commemoration Ceremony at the Tsitsernakaberd Memorial Complex. One hundred musicians from 40 countries will perform classical music by Armenian composers tonight at the Renaissance Concert in Yerevan at 8:15 p.m.
Ula Wozniakowska (Poland) and Vratislav Kratochvil (Czech Republic) came to Armenia together. 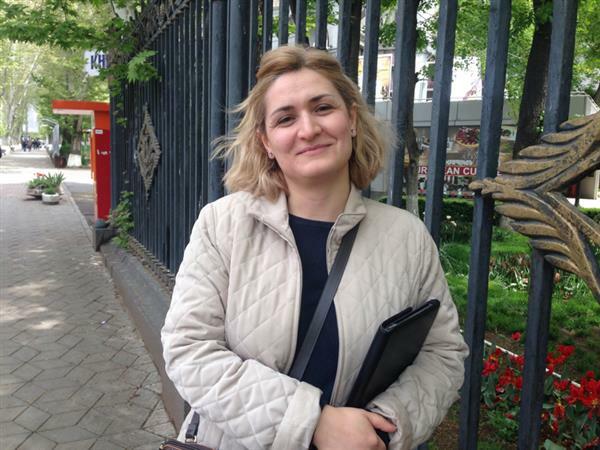 "I didn't know much about the Armenian Genocide", says Ula, "I started researching it after I heard about the SOAD concert in Yerevan. 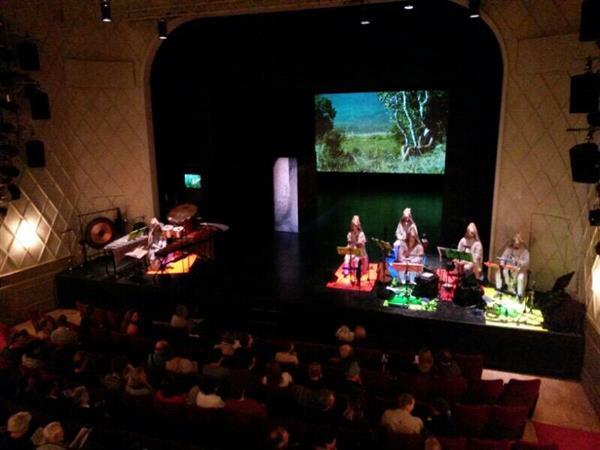 Serj Tankian talked about it during his performance, and now I'm eager to learn more!" 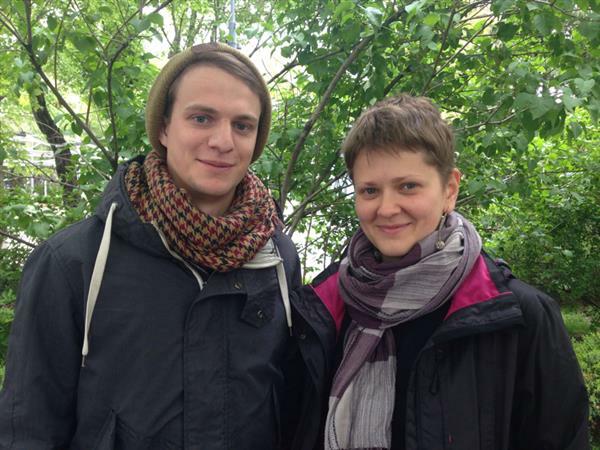 Arnaud Benoit and Alexandra Montaner are from Nîmes, France. "I am a huge fan of System of a Down", says Arnaud. 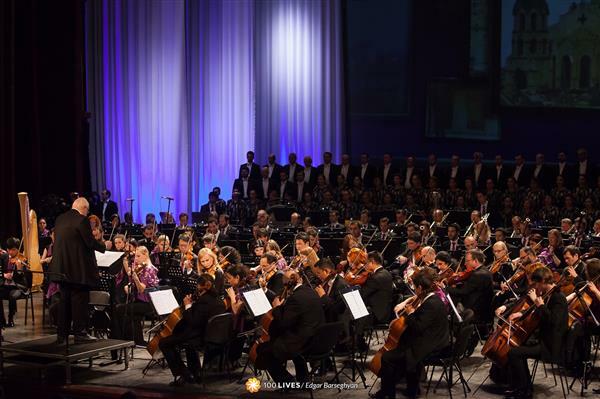 "This concert was a great opportunity for us to discover Armenia. 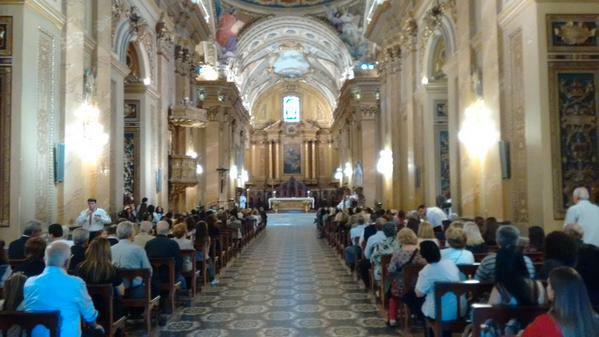 I have been traveling all over Europe but this is a bit further, of course. And with the Centennial it was now or never!" 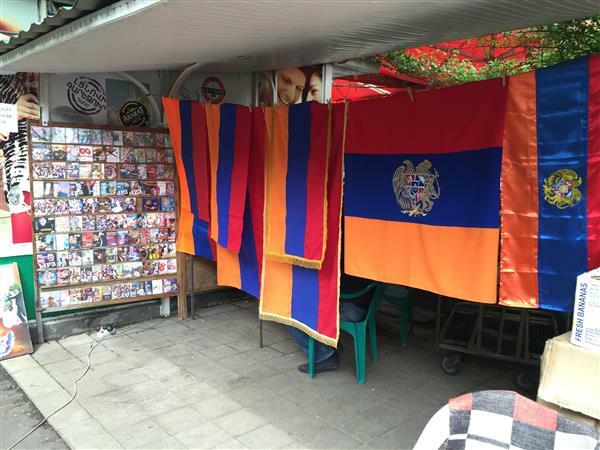 Armenian tricolor for sale. Vernisaj, Yerevan. The seller said demand has been very high. 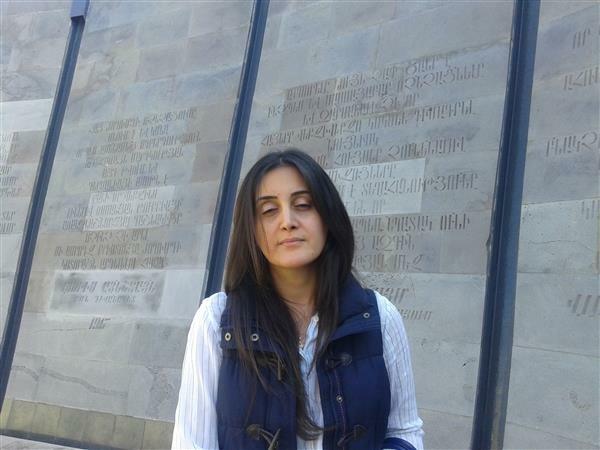 Narine Khachatryan is a proud Armenian who thinks the past should not be forgotten, but the present is more important: "The Genocide is part of our identity, but we have to think about the present and live for the future". 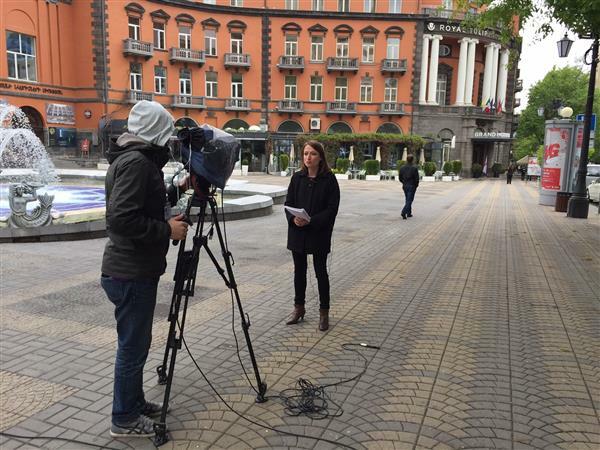 Armenia is at the center of the world's media attention today. 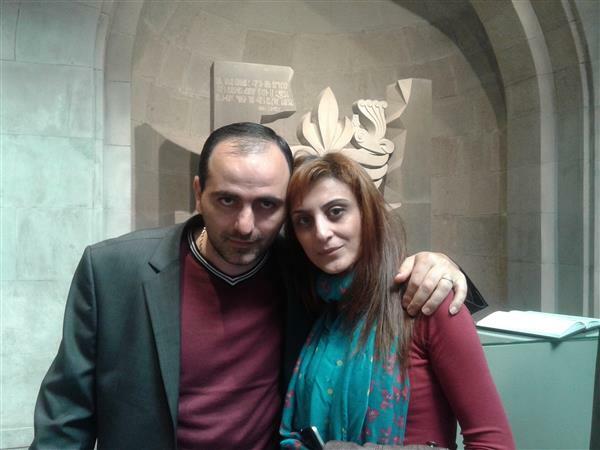 The Mikaelian family came from France to Yerevan for the first time on the most important journey of their lives. 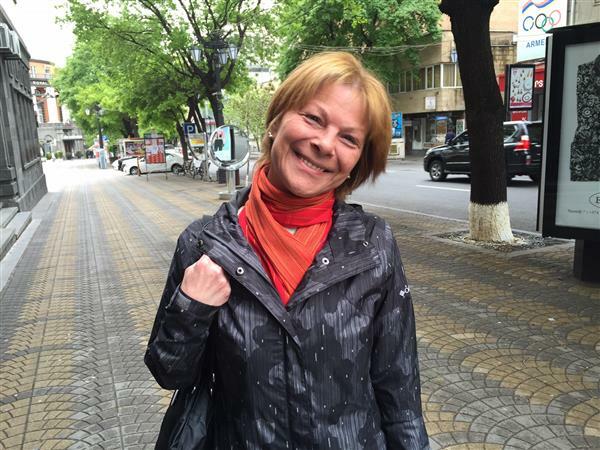 Terezia from Hungary came to Yerevan for the SOAD concert. "I'm half Iranian and half Hungarian. Had no idea about Armenia. 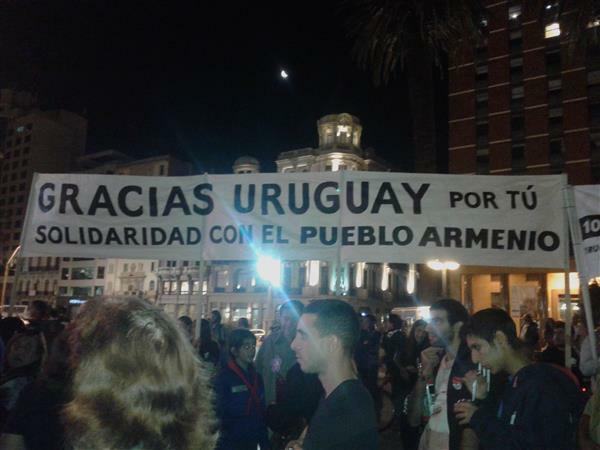 You should thank System of a Down for telling us what happened with your nation. Yesterday I went to the memorial." 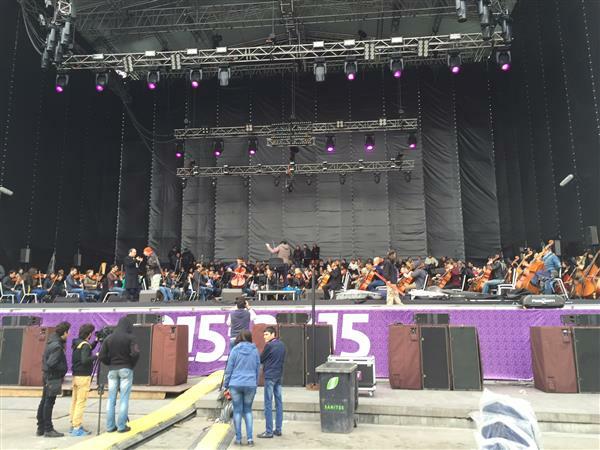 Sound check for tonight's World Symphony Orchestra concert at Republic Square, Yerevan. 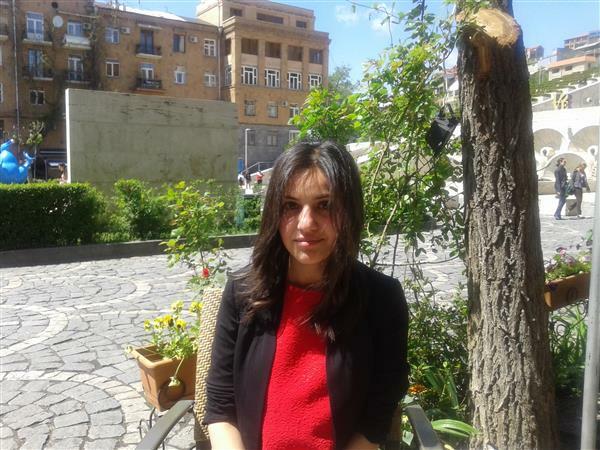 Sarine Havatian from Lebanon comes to Yerevan every year. We asked her about her Armenian heritage and what it means to her. 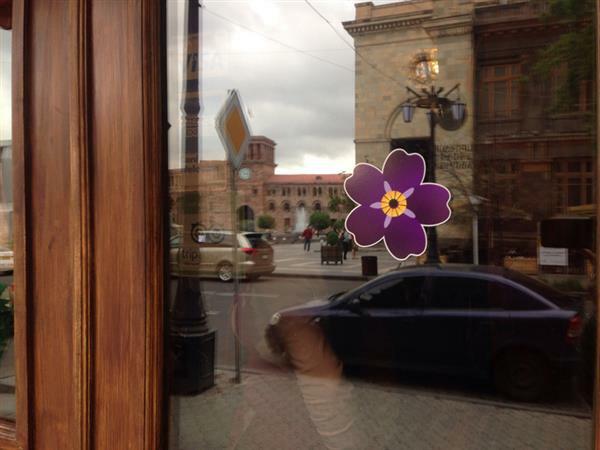 A memorial forget-me-not sticker on a cafe's window at the Republic Square, Yerevan. 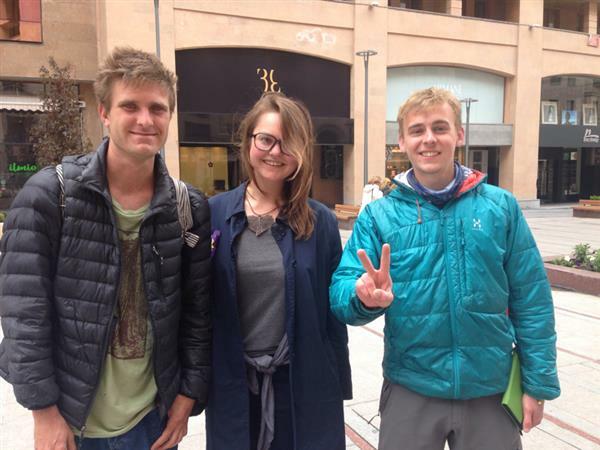 Mason Blum (United States), Anna Pestova (Russia) and Dariusz Zabieglo (Poland) have been doing volunteer work in Armenia. 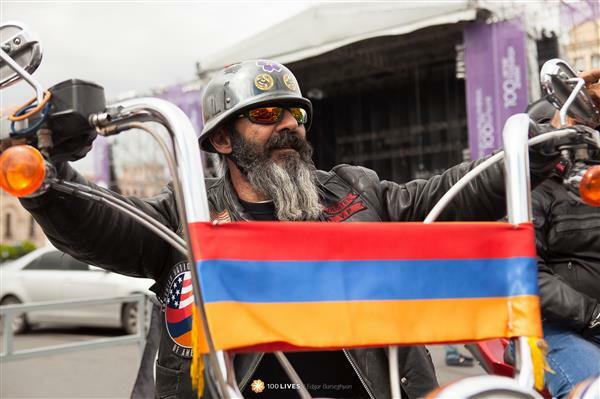 They came to Yerevan to participate in the commemoration events, and are looking forward to the Torchlight Procession that takes place tonight. 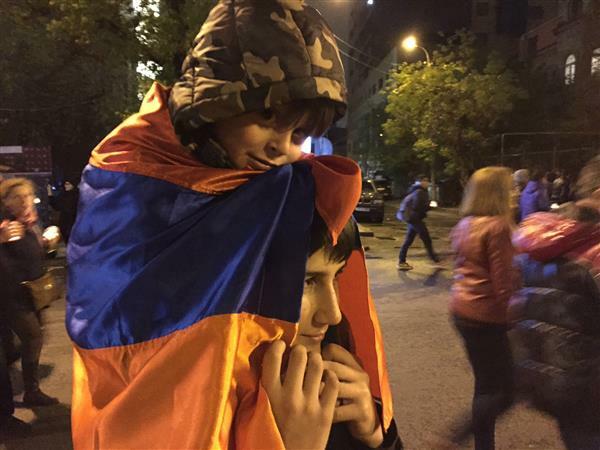 Many streets in Yerevan, Armenia, are blocked for the commemoration events. 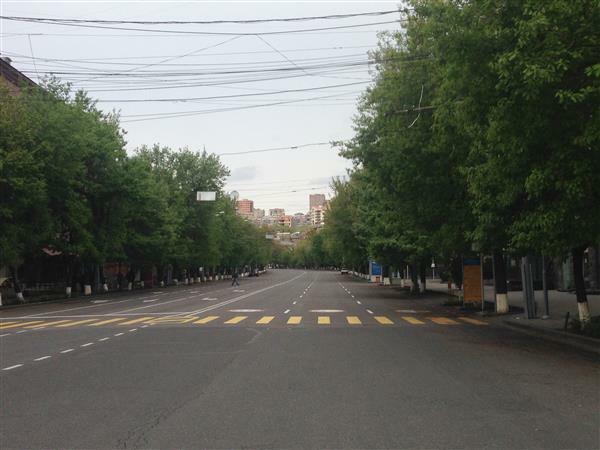 Baghramyan street in the very center of the city is almost completely empty. “Memory should never be used to divide, it should be used to unite. The centennial should symbolize peace and reconciliation for the entire world.” Francois Hollande speaking at the commemoration ceremony in Yerevan. 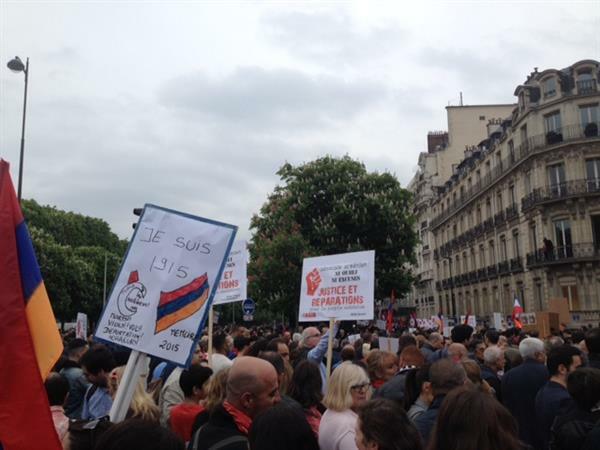 Since 2001, France publicly recognizes the Armenians Genocide of 1915. 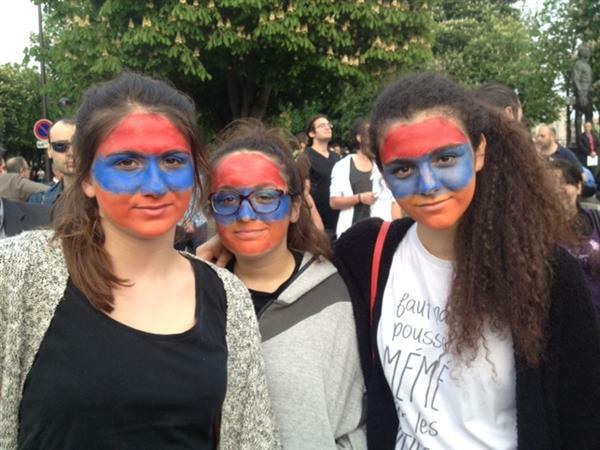 “This law was an act of truth, because only truth will appease those who survived and to render justice,” French President Francois Hollande said at the ceremony in Tsitsernakaberd. 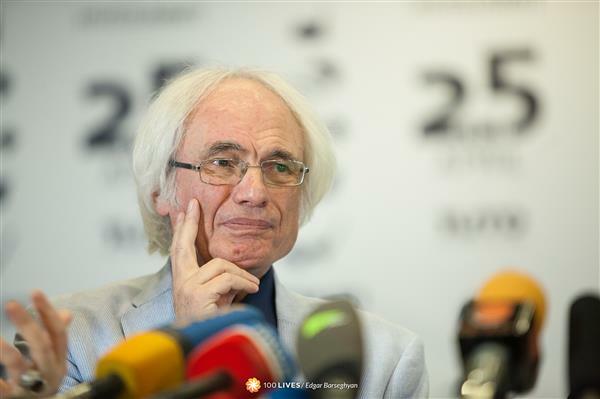 French President Francois Hollande speaking at the commemoration ceremony at the Genocide Memorial in Yerevan says the French are very proud of French-Armenian singer Charles Aznavour. 1. FRANCE: Lights of the Eiffel Tower in Paris will be switched off at 10 p.m. local time (midnight Yerevan time) in memory of the victims of the Armenian Genocide. 2. 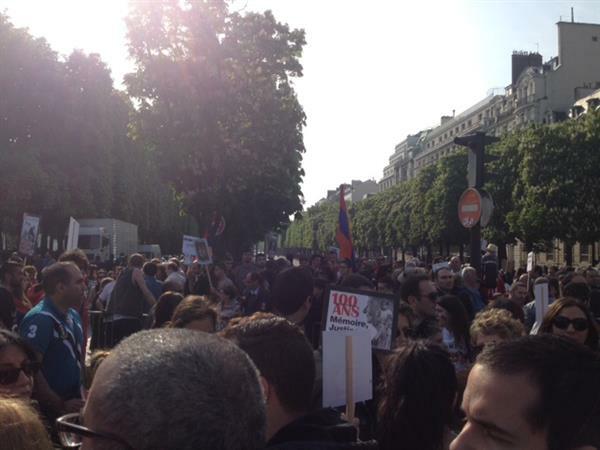 FRANCE: Starting at 3 p.m. local time a demonstration will take place at Place du Canada in Paris to commemorate the Armenian genocide. 3. 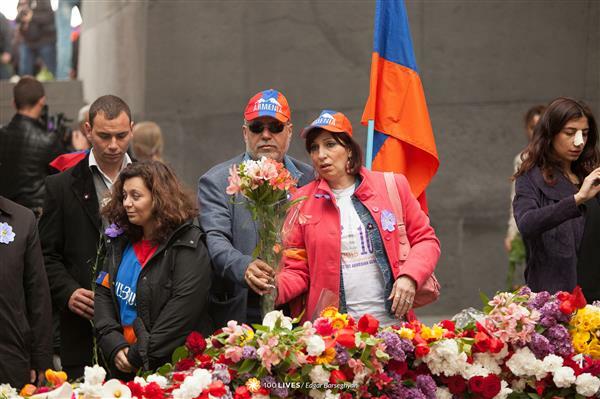 USA: A “March for Justice” from little Armenia to the Turkish Consulate will take place in Los Angeles, California. 4. 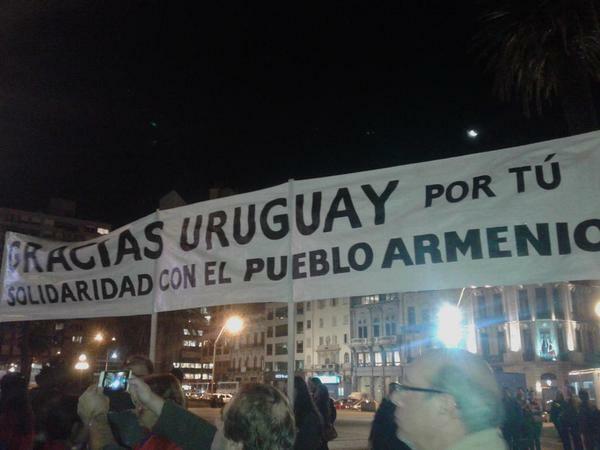 ARGENTINA: Mass will be held in memory of the martyrs of the Armenian Genocide in the St. Gregory The Illuminator Cathedral in Buenos Aires. 5. 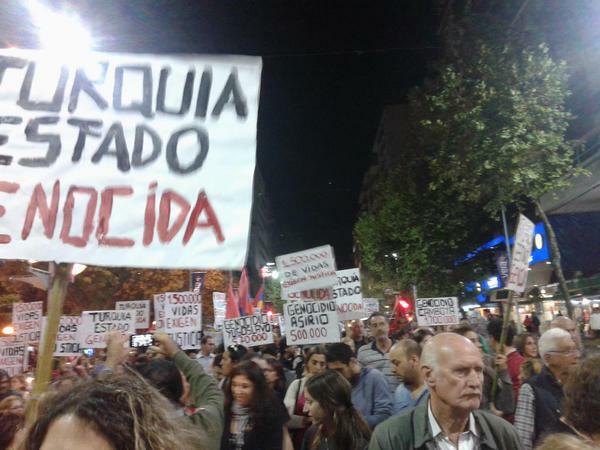 ARGENTINA: A march for Freedom and Justice will take place at 6 p.m. in Cordoba, Argentina, in memory of those who suffered in the Armenian Genocide. 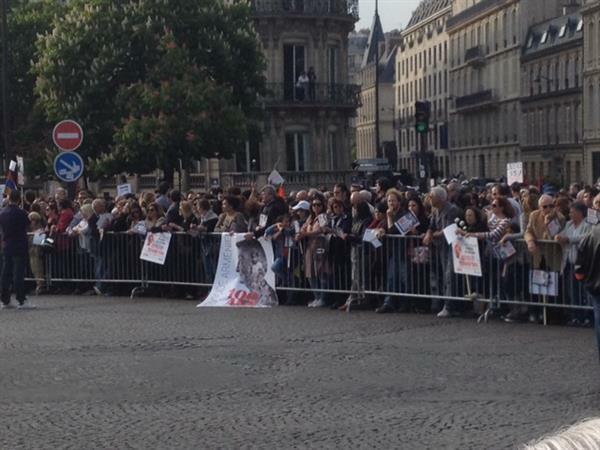 After the march there will be a recital for peace. 6. 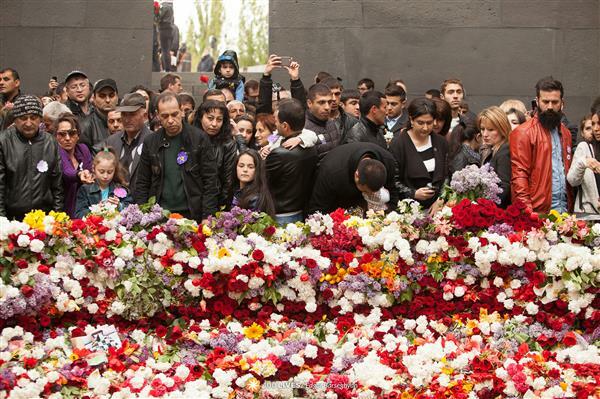 RUSSIA: A 3,000-strong rally will take place in the Gorky Park next to the Krymsky Bridge in Moscow starting at 3 p.m. local time to honor the memory of the victims of the Armenian Genocide. 8. 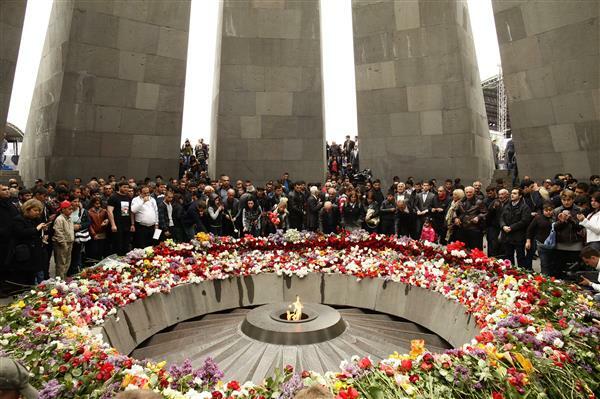 UNITED STATES: A 100-minute silent sit-in will take place in Love Park in Center City Philadelphia to commemorate the beginning of the Armenian Genocide. 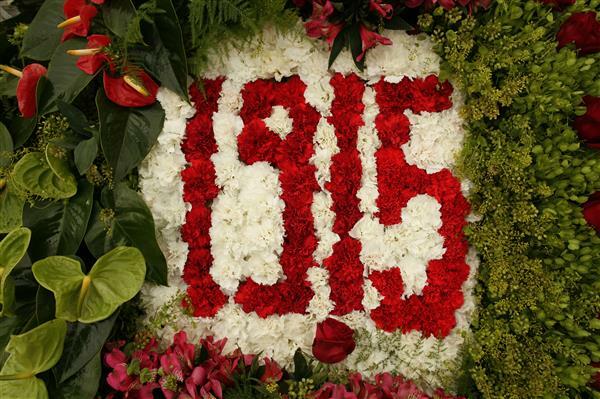 The President of Armenia Serzh Sargsyan: “100 years have passed but we will always remember. 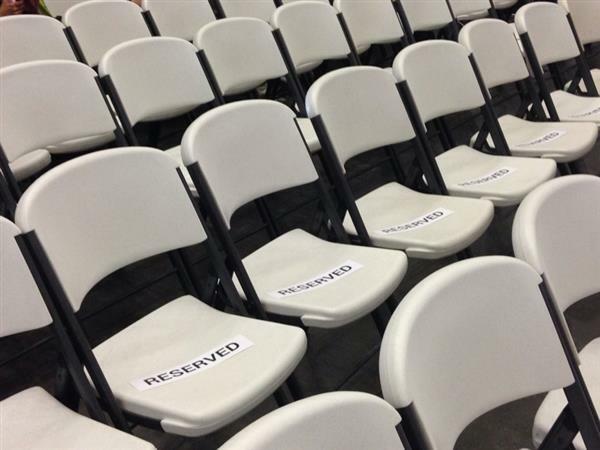 And we’re asking for recognition.” These words have received a standing ovation from the audience. 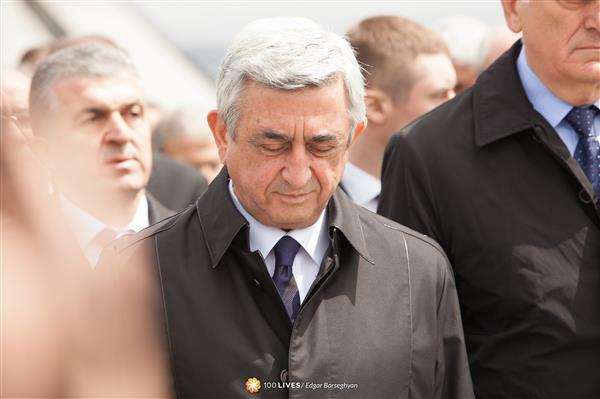 Serzh Sargsyan: “The Genocide was the worst crime to ever take place. 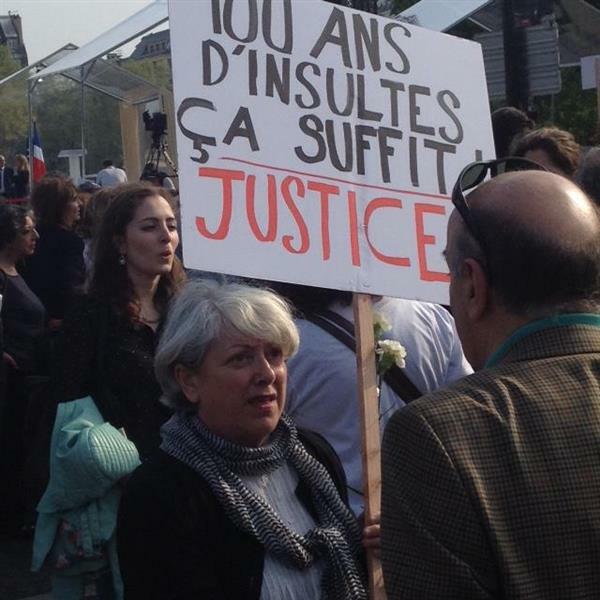 To deny such crime is to commit a crime against humanity”. 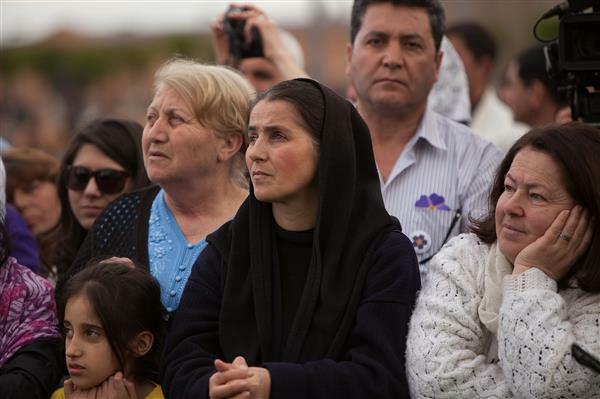 People watching the Canonisation Ceremony in Etchmiadzin, Yerevan, on April 23. 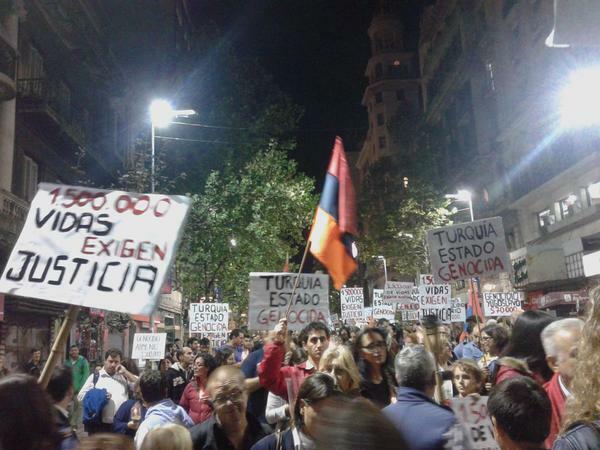 The march dedicated to the Armenian Genocide Centennial in Montevideo, Uruguay.